The main goal of this project is to use fluorescent tools and biochemical approaches to study the spatial and temporal distribution of metal ions in living cells. We primarily study the homeostasis and signaling roles of Zn2+. Zinc is the second most abundant transition element in the human body and plays important roles in many cellular processes. Intracellular Zn2+ levels must be tightly controlled, as Zn2+ dysregulation is associated with cell dysfunction and human diseases. A large portion of cellular Zn2+ is stably bound with proteins. There is also a pool of mobile Zn2+ weakly bound or exchanged with small proteins or molecules. 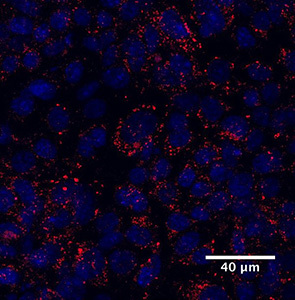 Using different biological models, such as lactation and prostate cancer, we are trying to understand how cells regulate and re-model zinc homeostasis to meet the needs of different biological and cellular processes. There are a number of systems in which transient changes in intracellular Zn2+ concentrations have been linked to important downstream events. 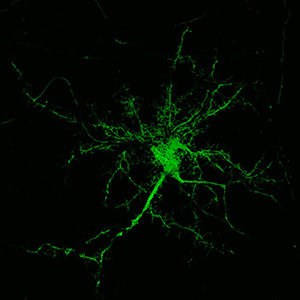 We use methodologies including fluorescence imaging, next-generation sequencing, mass spectrometry, and biochemical techniques, to research aspects of Zn2+ signaling in different model systems, such as neurons, lymphocytes, and infected macrophages. In each model we aim to characterize the dynamics of Zn2+ signals, identify and monitor Zn2+ signal targets, and determine cellular responses to Zn2+ signals. Han, Y., Goldberg, J.M., Lippard, S.J. & Palmer, A.E. Superiority of SpiroZin2 Versus FluoZin-3 for monitoring vesicular Zn2+ allows tracking of lysosomal Zn2+ pools. Scientific Reports 2018, 8(1):15034.